This is a set of 36 cards (9 sets of 4 each, grouped by engine displacement), printed by F.X. Schmid, Vereinigte Munchener Germany. The set is marked Quartett Nr. 52522, and comes packed in a clear plastic cover, with pale blue back/bottom cover. 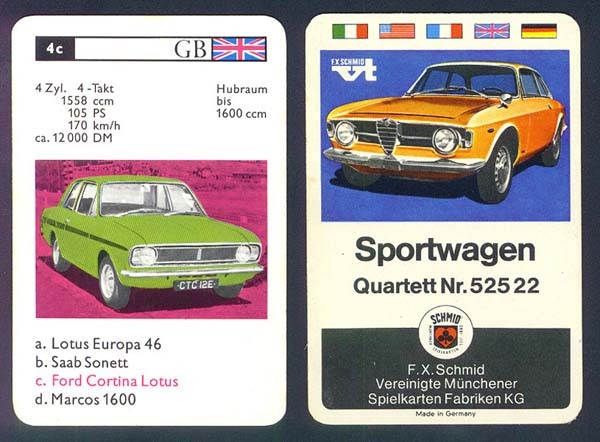 The set is very similar to the Top Trumps sets printed and played in the United Kingdom, that are used as part of a "deal and compare" card game. Try this link for a description of the game. The image on the right, is the "cover card" from the set. I have no idea when this set was printed. I don't believe they are common, and can not find any new sets for sale. I think they are only available on the used market.